Justice Martin J. Jenkins was confirmed to his current position as an Associate Justice of the California Court of Appeal, First Appellate District, Division Three, on April 4, 2008. Prior to assuming office as an associate justice, Justice Jenkins served as a judge of the United States District Court for the Northern District of California from November 1997 to April 2008. Justice Jenkins graduated from Santa Clara University in 1977, and after a brief period of employment with the Seattle Seahawks Professional Football Team, entered law school at the University of San Francisco School of Law. He obtained his law degree from U.S.F. in May 1980, and upon graduation was the 1980 recipient of the law school's "Judge Harold J. Haley Award for exceptional distinction in scholarship, character and activities." After law school, Justice Jenkins worked as a prosecutor for the Alameda County District Attorney's Office from 1980-1983. 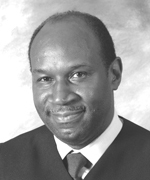 In 1983, Judge Jenkins joined the United States Department of Justice as a Trial Attorney, and was assigned to the Civil Rights Division-Criminal Section. As a lawyer in the Civil Rights Division, he prosecuted racial violence and police misconduct cases for several years. In 1986, Justice Jenkins accepted employment as a trial attorney with the Pacific Bell Legal Department in San Francisco, handling a wide variety of civil litigation matters, until his appointment by Governor George Deukmejian to the Oakland Municipal Court in 1989. In 1992, he was elevated by Governor Pete Wilson to the Alameda County Superior Court and in 1995, became the Presiding Judge of the Juvenile Division. A native of San Francisco, Justice Jenkins is involved in numerous civic, religious, and charitable organizations serving youth in the San Francisco Bay Area. On April 15, 1998, Justice Jenkins was awarded the St. Thomas More Award, given annually by the St. Thomas More Society of San Francisco, in recognition of his distinguished record of service and dedication to his family, his church and his community.